Enjoy the fresh quality and flavour that comes with 40 years of expert sourcing and roasting in a single- serve, quick-brewing K-Cup® pod. 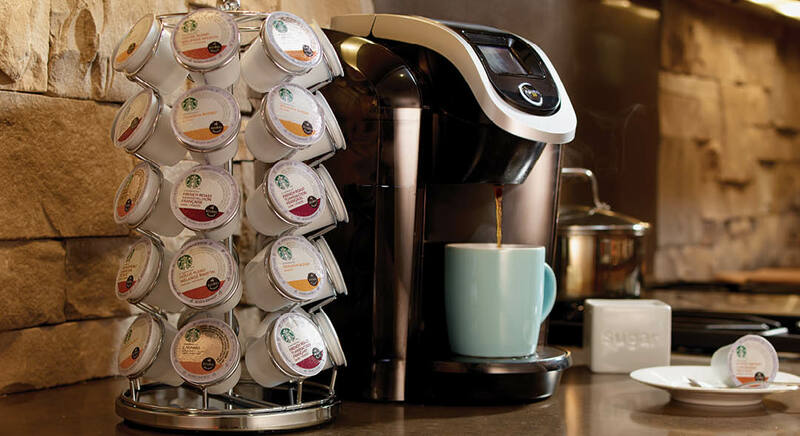 Designed for use with the Keurig® Single Cup Brewing System to provide a premium brewed coffee experience in less than a minute. We’ve sipped coffee with farmers from Latin America for decades, sitting on their verandas, overlooking lush coffee groves. Most times it was a lightly roasted coffee like this one. It took us more than 80 tries to get it right. Veranda Blend™ is subtle with delicate nuances of soft cocoa and lightly toasted nuts. We gently roasted this coffee, revealing a surprisingly intense and beautifully expressive blend. From the first sip, African beans sing with juicy, lemony notes, followed by the bright, lyrical finish of Latin American coffees. As mild and welcoming as a gentle sunrise, this blend’s inviting character is a pleasure to wake up to. We’ve roasted the Latin American beans just enough to reveal their nutty flavour and touch of acidity, culminating in a crisp and pleasant finish. We introduced this whole bean blend in 1998 for those who prefer a milder cup. A shade lighter than most of our medium roast offerings – more toasty than roasty – it’s perfect if you want to wake up to a less intense coffee but still want a lot of character. A blend with fine Latin American beans roasted to a glistening, dark chestnut colour. Loaded with flavour, balancing tastes of nut and cocoa, just a touch of sweetness from the roast. This coffee is our beginning, the very first blend we ever created for you back in 1971. Also available decaffeinated. In 2008 our master blenders and roasters created this coffee for customers who wanted a freshly brewed cup they could enjoy throughout the day. A smooth blend with Latin American beans offering subtly rich flavours of cocoa and toasted nuts, it’s perfect anytime. Straightforward, light-bodied with low acidity, and immensely popular since 1971, our darkest roast is adored for its intense smokiness. Like the lush Indonesian island of its origin, this spicy, full-bodied coffee stands alone. Our master roasters love transforming these unpredictable beans from dark coral green to tiger-orange to a rich, oily mahogany, revealing bold flavours that many of us can’t live without. Perfecting the balance between mellow Starbucks® Blonde roast beans and natural vanilla flavour results in a flavoured coffee that could only come from Starbucks®. Caramel adds just the right touch of richness to every cup. Our blend of caramel flavour with a lighter roasted coffee creates moments to savour, from the brewing aroma to the very last sip. Delightfully decadent. Rich mocha flavour meets our most popular roast in this irresistible treat. Delectable dark chocolate works its magic, turning each cup into freshly brewed indulgence. This blend of premium arabica beans from Latin America was specially crafted to brew over ice in your Keurig® brewer. The resulting sip is lively and crisp with a delightful taste of sweet vanilla flavour. Fill your cup with an indulgent favourite inspired by Starbucks® handcrafted hot cocoa. Our Classic Hot Cocoa delivers a rich and creamy way to treat yourself, sip after satisfying sip. Keurig, Keurig 2.0, the K logo, the Cup and Star design, Keurig Brewed, K-Cup, and the Keurig brewer trade dress are trademarks of Keurig Green Mountain, Inc., used with permission.